Thorstorp’s Farm embraces about 53 hectares of land, of which 30 hectares is farmland. Belonging to the farm is also 13 hectares of natural grazing land, which helps preserve the biological diversity. In the stable (renovated in 2000) there are 12 stalls indoors and 4 stalls outside. In addition to our own horses, we rent stalls and most things are included, except for the clearing out of dung. There is an illuminated hippodrome 20 x 60 metres, an outside spot for sluice, a WC and a nice room for coffee/relaxation and a changing room. 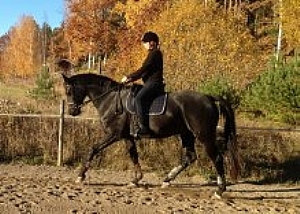 5 minutes by car to a newly built riding stable, where riding stable cards are available. We also admit convalescents, colts and foal mares, including monitoring of foal. If you need stalls for a shorter period of time, or just for the night as a break during long transportation, this can be arranged also. Please see a short presentation. A diploma mare and A-rewarded, born in 1990. (Arram-Bonaparte-Maximus) A secure horse with a lot of power and nice walks. Has given eight lovely foals, of which several in class I and diploma. Mare born in 1996. B-rewarded. 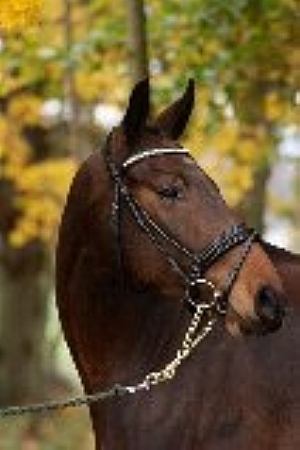 (Hamilton-Cortez-Limelight) A large, nice and sensitive horse with show jumping origin (BLUP-index jumping 119). The mother, Javeline, engages in Grand Prix dressage in Germany. Has given six nice foals and will now take a break to be ridden and get back to competing this spring. Gelding born in 2005 (Blue Hors Romancier-Arram-Bonaparte) Lavendel’s offspring. A calm and cooperative horse with charisma and excellent walks (amongst others 9th in trotting). 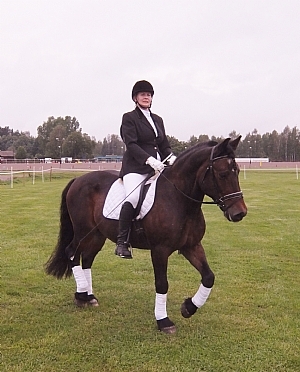 Dressage diploma at the thee year old test in 2008. Gelding born in 2007 (Cornetto-Hamilton-Cortez) Jeanna’s offspring. A future show jumping horse! 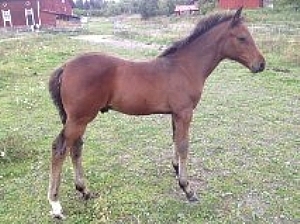 Class I as a foal and selected to the foal championship. Nice and easy to handle. FOR SALE! Stallion foal born in May 2008 (Manhattan-Arram-Bonaparte) Lavendel’s offspring. Very social and lovely foal with good motion. Displayed at the foal control at Vreta Nature Resource Programme with a total of 48 points! (8 7 8 8 8 9). Selected to the National foal. FOR SALE! Gelding born in 1991 (Mycklar-Vine-Kerrim) North Swedish domestic horse, one of the lighter types. Our best all-round horse! Nice and well educated. Has competed in both dressage and show jumping. 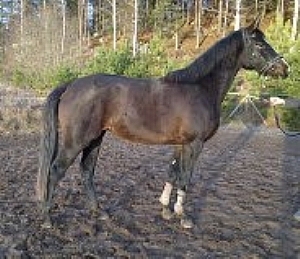 Mare born in 2005 (Apollo-Vine-Kerrim) North Swedish domestic horse. Vilda has been sold and has moved to her new home.